The Imperial Irrigation District Board of Directors approved a resolution supporting the Memorandum of Understanding between Imperial and Riverside counties on the Salton Sea. 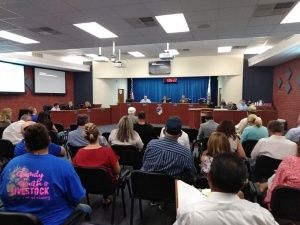 At their meeting held Tuesday, August 28, the board approved with a vote of 3-0 a resolution to support both counties in their efforts to restore the Salton Sea. Directors Juanita Salas and Norma Sierra-Galindo were absent from this meeting. “We went through the MOU adopted by the counties and we incorporated a section in our resolution those areas were IID already publicly stated their support position for those projects or priorities,” said Antonio Ortega, IID Governmental Affairs. Ortega added that one part of the resolution states that the counties are still developing the concept but they will provide information as it becomes available. The MOU was approved on June 26, 2018, outlines a good faith commitment of collaboration between both counties. Architects of the agreement – Riverside County Supervisors V. Manuel Perez and Marion Ashley, and Imperial County Supervisors John Renison and Ryan Kelley – noted that infrastructure financing strategies in each county will be far more effective when reinforced by integrated planning efforts between the two counties and among the Salton Sea Authority members. The IID resolution states that the Imperial Irrigation District, as a member of the Salton Sea Advisory Board, urges the counties to continue working closely with the authority to enhance collective efforts and strategy towards the restoration of the sea. IID Division 2 Director Bruce Khun said that he was uncomfortable with the resolution because of the differences and past litigations but said he would vote in favor because of overall good intention by both counties. Board President James Hanks agreed, “We might have disagreements with Riverside County but for the people of the Coachella Valley that live around the Salton Sea we are in agreement that there is a problem that needs to be fixed and we are united in that front,” Hanks said. County leaders call for cooperation to fully implement a Perimeter Lake concept that would address air quality concerns by stabilizing the shoreline while providing habitat for waterfowl as well as enhancing economic opportunities in recreation and renewable energy. The formal revitalization plan, proposed by the California Natural Resources Agency and endorsed by the Salton Sea Authority, already includes portions of the Perimeter Lake in its list of projects prioritized for funding. But the state has only designed and funded the first sections in a larger project intended to eventually cover exposed shoreline with water that continues to flow from agricultural lands that surround the Sea. The Counties want to accelerate the pace of progress the Perimeter Lake by working more closely together to establish complementary infrastructure investments like the Enhanced Infrastructure Finance District (“EIFD”) that was proposed as a local financing tool in the Financial Feasibility Action Plan adopted by the Salton Sea Authority in 2016. That financing mechanism is designed to stimulate economic development around the Sea that can eventually support a healthier, more prosperous Salton Sea.